[PDF] Wine Politics: How Governments, Environmentalists, Mobsters, and Critics Influence the Wines We Drink | Free eBooks Download - EBOOKEE! Posted on 2017-11-29, by luongquocchinh. Description: After reading this intriguing book, a glass of wine will be more than hints of blackberries or truffles on the palate. Written by the author of the popular, award-winning website DrVino.com, Wine Politics exposes a little-known but extremely influential aspect of the wine businessthe politics behind it. Tyler Colman systematically explains how politics affects what we can buy, how much it costs, how it tastes, what appears on labels, and more. He offers an insightful comparative view of wine-making in Napa and Bordeaux, tracing the different paths American and French wines take as they travel from vineyard to dining room table. Colman also explores globalization in the wine business and illuminates the role of behind-the-scenes players such as governments, distributors, and prominent critics who wield enormous clout. Throughout, Wine Politics reveals just how deeply politics matters right down to the taste of the wine in your glass tonight. 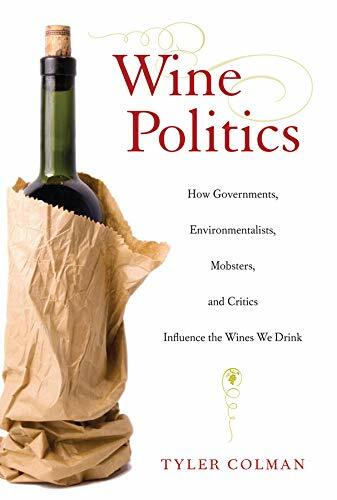 No comments for "[PDF] Wine Politics: How Governments, Environmentalists, Mobsters, and Critics Influence the Wines We Drink".